Posted on July 30, 2012, in Mountain Lion and tagged aerial, cosmos, find, hidden, Mountain Lion, national geographic, screensaver, wallpaper, where. Bookmark the permalink. 18 Comments. I dont have the screensaver.framework file when i navigate to this place? And of course you must be looking on either 10.7 or 10.8. This doesn’t apply to Snow Leopard or earlier. How did you get the date and time onto your desktop? I like it! 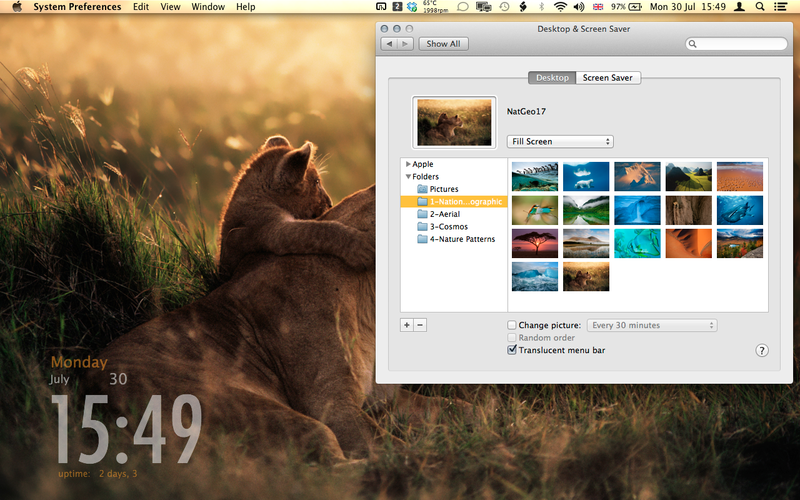 any ideas how to install the national geographic screensaver on lion 10.7??? If they’re not included in the Screensaver.framework folder then you can’t install them unless you have (or know someone with) a Mountain Lion installation. Then you could copy them from that machine to your Lion machine. Sorry…..Your directions on how to get hidden screen savers for Lion 10.8.2, iMac, didn’t work for me. I tried several times with no success. Directions were followed step by step. Lion is in perfect working condition too. This only works for Mountain Lion (10.8.x), not Lion (10.7.x). HDD > System > Library > Frameworks > Screensaver.framework > Versions > A > Resources > Default Collections? You don’t need to copy them, just link them to your system preferences by dragging them into the left pane of the Desktop&Screensaver tab. That’s true, but then you risk the chance that they get removed by an update or upgrade in the future. Moreover, by copying them into a User’s account it means that that user can still have access to them even if that account does not have Admin user privileges. actually scratch that, i found the library folder (i hade to make it unhidden) ANYWAYs, Just like Eric ^ said…..I do not have a frameworks folder….any suggestions? I have no idea how to get there? Ive had my Macbook Pro for a year now but I am not sure how you got there? Any suggestions? I dont even know where to go once i open up finder? Help, I really want these wallpapers! my Screensaver.framework icon is not there….any thoughts? Are you sure you’ve chosen the Library directory inside the System directory? I made that also made that mistake. I hope this helped you and a happy new year!! Thanks a million! I always loved looking at my screensaver and seeing those national geographic pics. This tutorial is perfect. But seeing your screenshot, I really really like how the time is displayed like that on your wallpaper? 3rd Party app? Or is this a setting straight from Mountain Lion? For the clock have a look at ‘GeekTool’ on my Free Downloads page. Hi Phil – great looking clock. Does it work in Mountain Lion? Also do you have any instructions for using it? When I drag one of the icons onto my desktop I can’t seem to do anything with them.